In a time where it seems like we are ridden with tragedy everyday, it is always nice to see some light in this seemingly dark World. The movie Black Panther has inspired many, and partially through the use of social media! An online crowd funding effort turned a social media hashtag into a movement that has already let tens of thousands of kids see Marvel’s latest superhero movie for free. Thanks to a worldwide effort, dubbed #BlackPantherChallenge. The challenge prompted community members to pay for children’s tickets and concessions via websites like GoFundMe. New York resident, Frederick Joseph reportedly started the movement by raising more than $40,000 to let Harlem children see the superhero movie in theaters. The global GoFundMe page claims that more than $400,000 had been donated by at least 10,000 people in 40 different countries. The Atlanta Hawks, invited 150 youth and chaperones at Regal Atlantic Station Stadium as part of the team’s Black History Month celebration. Hawks players, included Mike Muscala and 2018 Mountain Dew Kickstart Rising Stars participant Taurean Prince, who addressed the youth and engaged in a Q&A session prior to watching the film. Attendees included young people who have been touched by the juvenile justice system, members of the BlazeSports Jr. Hawks wheelchair basketball team and youth from local parks and recreation centers in underserved communities. Upon their arrival, the youth received a VIP welcome, complete with a red carpet photo shoot. 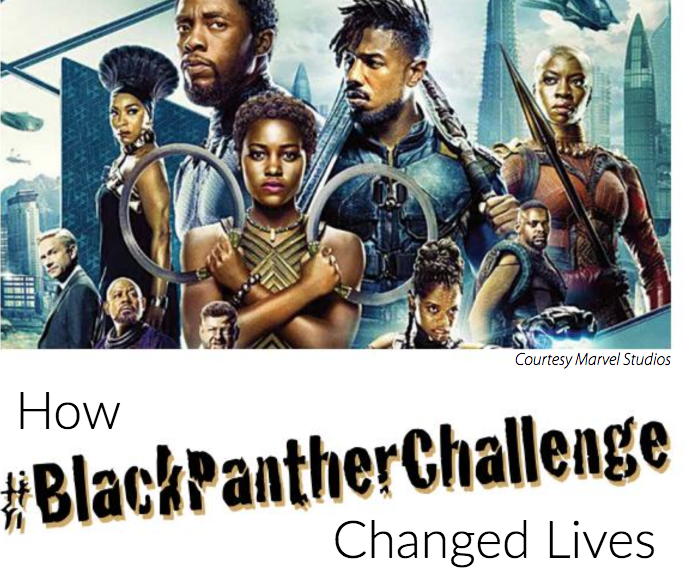 #BlackPantherChallenge is going to take donations and distribute the money to organizations that may need help meeting their goals for the challenge. In order to be considered, the campaign must be started by or for a charity that aims to take kids to see the movie. Some critics are calling it the best Marvel movie to date, it maintains a 97 percent “certified fresh” score on review site Rotten Tomatoes. The film features a predominantly black cast and focuses on T’Challa, played by Chadwick Boseman, who succeeds his father as king of the fictional African country Wakanda. Besides being one of the best Marvel movies…..Black Panther has brought an inspirational story that we have been waiting for! !